Please forgive any typos or poorly edited files in this post and any future posts. My vision has been adversely affected by my recent stroke. 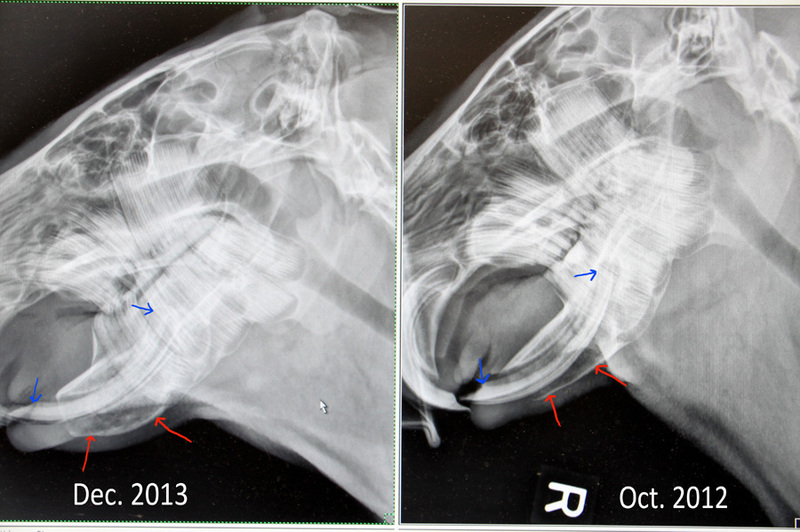 The xray image above shows Garibaldi’s teeth and jaw last October versus this month. The red arrows point to the jaw bone and the blue arrows point to his right lower incisor. The big change evident here is that the jaw bone has become infected and is now larger and less dense than it was last year. 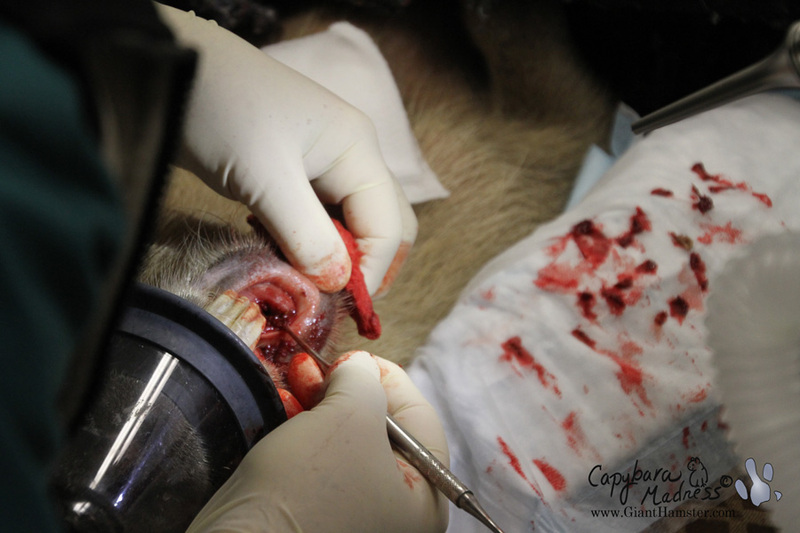 This prompted our vet, Dr. Hoppes of Texas A&M Vet School and Dr. Dodd, who is a veterinary dentist to strongly suggest that the incisor be removed. You cannot imagine how strongly I resisted this. What is a capybara without his teeth? How much pain would he experience? What would happen if the tooth were not removed? What would happen if the tooth did come out? I hated the answers to all of those questions. Question: Can a capybara live without its incisors? Answer: Probably, but we’ve never done it before and don’t know of any cases where it has been done. Rabbits get along fine, generally, if given proper care. Question: How much pain would Gari be in if we removed the tooth? Answer: Lots. Maybe so much that he would not eat and his digestive tract would shut down, which would kill him. Capybaras have bacteria in heir intestines to digest cellulose and when those bacteria do not get enough food, they die. When they die they release toxins that kill their host. On the other hand, if the tooth was dead, maybe there would not be so much pain. Question: What would happen if the tooth were not removed? Answer: While it was possible that removing the tooth might kill Gari immediately, the vets agreed that not removing it would result in a slow and probably even more painful death. But it appeared that the gum was not attached to the tooth which would make the extraction easier and less painful. It also created a pocket that allowed rotting food and other debris to collect and fester, promoting infection. Taking the tooth out would allow that pocket to be thoroughly cleaned and packed with antibiotics that might help stem the bone infection. I hated being placed in this position. I have said that I would not allow Gari to suffer if there was no hope, but how could I know if there was hope or not? And I was not ready to let him go, so I approved the tooth removal. Gari’s lower right incisor showing the pocket and some of the debris that was removed from it. Once Dr. Dodd began removing the tooth. It was hardly attached to the surrounding tissue. The pocket went all the way down to the bone and was full of old, rotting food. When the tooth came out, it was obvious that the vets were right; the tooth was dead and it was making Gari sick. 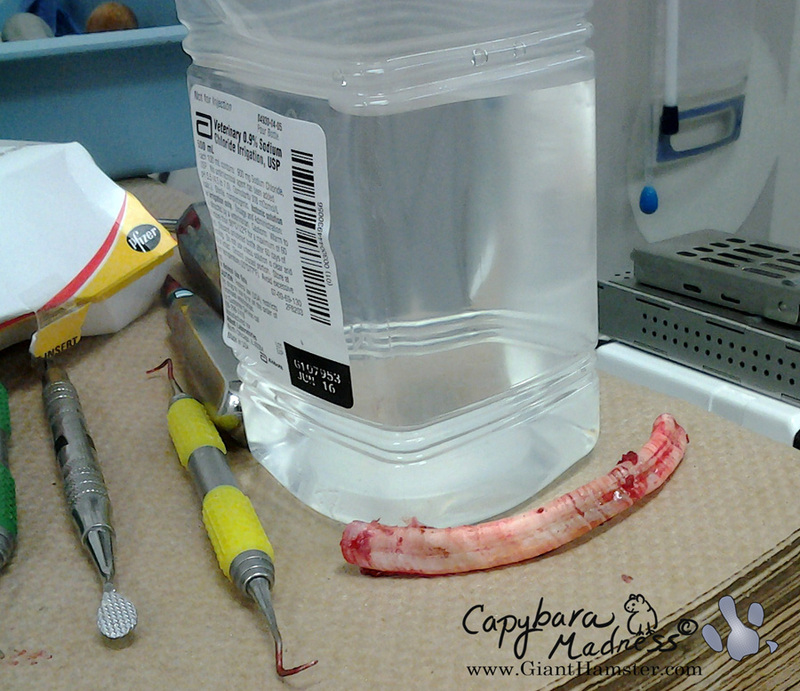 After Dr. Dodd finished with the incisor, it was time to trim some of Garibaldi’s other teeth. At this point it became clear that at least two of the molars on the lower right are probably dead and will need to be removed in the near future. Ultimately, probably all of the teeth on the lower right will need to come out. Once that is done, the next step would be to remove the lower jaw. Antibiotics used to treat bone infections in people and other animals are lethal to rodents. I guess you can see where I am going here. Gari’s condition is incurable and progressive. The only questions are how far am I willing to go and how much can Gari tolerate. I don’t have the answer to either of these questions. So far Gari is struggling to overcome the pain associated with the loss of his tooth and with the surgery in general. He is eating small amounts and taking his medications, which is good. 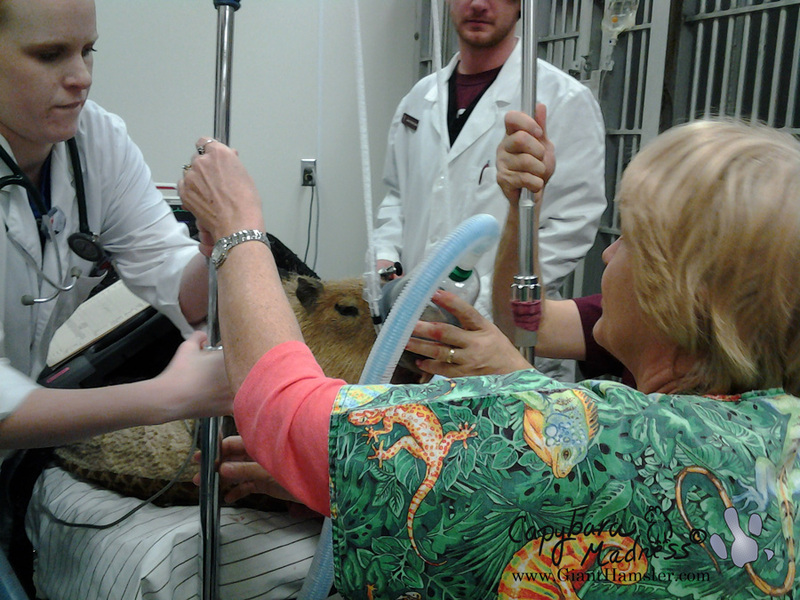 We are also giving him Critical Care and probiotics. I think he is going to make it through this stage okay and gain at least a few weeks of relatively good health. He should go back to the vet in about six weeks but I will probably stretch that to eight since I can’t stand to see him suffer like this. The bottom line is that Gari is going to die, probably within the next six months and almost certainly within the next year. We are doing everything we can but there isn’t much we can do. All of this was preventable. Let me explain. The first issue the found was that Gari had a rotated molar on his lower right that was cutting into his tongue. Because the molar had rotated, it allowed food to become trapped underneath it. That rotting food allowed an infection to become established in his gums. While we treated that infection, unknown to us, it migrated into the surrounding bone. Over the course of the last year, the infection traveled through the bone to the adjacent teeth and ultimately to the right lower incisor. This cascade of horrible events was made possible by the fact that Gari has low bone density. The reason he has low bone density is because he was malnourished when he was a young, growing capybara. This was exacerbated by the fact that he was kept strictly indoors and got very little natural sunlight and so probably had a vitamin D deficiency. When I got Garibaldi at almost ten months old, he weighed only 45 lbs. This is just over half what Caplin Rous weighed at that age. Although he did not look emaciated, he was basically starving. After I got him, Gari started getting a better diet and lots of sunlight. I was surprised that he was able to overcome his early malnutrition to achieve an adult weight of 120 lbs, which is at the lower end of the documented weight range for wild common capybaras. But the damage had already done. Garibaldi’s health issues come at a particularly bad time for me since I am still recovering from my stroke. I hate that I cannot see him clearly, that I cannot photograph him well and that I am at such a disadvantage when caring for him. I can hardly see his little mouth in order to stuff a syringe full of Critical Care or medication into it. I cannot tolerate the thought that he might not live long enough for us to spend another summer of long afternoons with him resting on my lap in the pool. Somehow I have to give him–give us–that. One final word. Please respect our religious beliefs. We are atheists and while you ay find prayers and stories about reunions at he “rainbow bridge” comforting, they bring no comfort to us. Please try to find some other words to express your feelings. Or you can make a donation to the ROUS Foundation for Capybara Veterinary Medicine or make a purchase from my online store. I am not sure what I am going to do with this blog going forward both because of my vision problems and because of Gari’s medical issues. I have no words for how sorry I am to hear this. I know you’ve taken wonderful care of Gari and will do what’s best for him. Melanie..you could not have said it better..well done and always up front about the capys health..you have done a great job and you should never have any regrets..Love that boy as long as you have him. I’m so sorry to hear this, Melanie. It feels like such bad timing. You’ve given Gari such a better life than he had, and lots of fans, too. Our animals give us so much as well. Cherish the time you have together. I hope it will be a good long time still. I am so very sorry about the horrendous challenges you and Gari are facing! My thoughts are with you! I am so sorry to hear this. You have been a wonderful momma to him and he has had a lot of love, just keep on loving him as long as he is with you. Thinking of you both. I am so, so sorry you are going through all of this at once. I’ve been following your wonderful household–I read your blog so often I feel like I know you!–for years, and I can only imagine how difficult this is for the both of you. Gari could not have asked for a better, more compassionate and more in-tune “mentor.” I will donate to the ROUS Foundation, but please let us know if there is anything else, anything at all, we can do to help you during this time. This is so sad, Melanie. We all know you’ve done EVERYTHING to give the best life to Gari (as well as Caplin). These capys are so fortunate to have spent the majority of their lives with you. They are superstars <3 If you can, please keep us updated. I hope we read that Gari is comfortable and you can spend more quality time with him. Melanie my heart aches with your struggle. 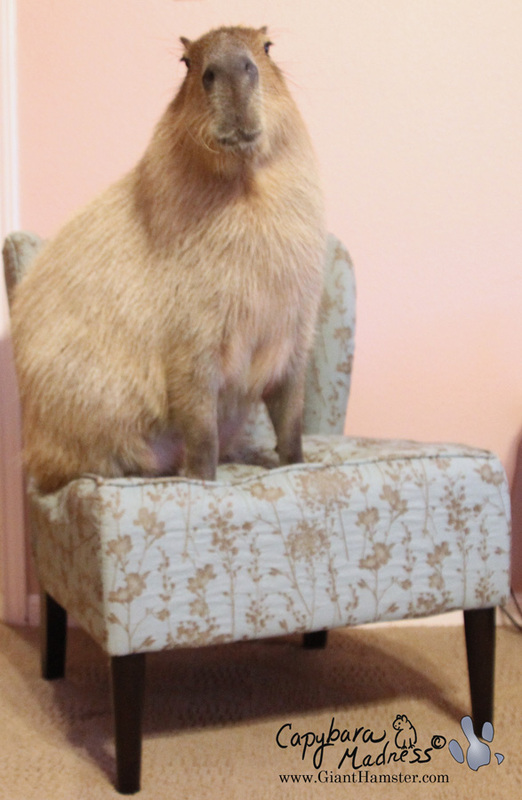 Despite not feeling well, that top photo of Gari on the chair is still beautiful. I want to thank you for sharing your life with your capys. I do hope nature allows much more time with him. I am sorry you are going through all of this. I am so sorry, Melanie. Just know that you have done your utmost for Gari…and knows what it is like to be loved and nurtured because of you. Hugs! You are both in my thoughts. Not fair, life is just not fair. I wish I had the resources to help both of you. I am so sorry to hear this and will be keeping you in my thoughts. I’m so sorry. I know how painful it is to see a furry family member in pain. I’m hope that you and he can have many months together. I too am so sorry to read about your baby’s situation. I hope that vet’s can decrease he pain and that you do get one more summer together. Please take care of yourself and give your sweetie a hug for me. Oh, Melanie, I am so sorry for all that you have been through. I understand the struggle you are facing. I love that you have taken the time to share Gari with us. I will make a donation. I love these animals, too. I hope you can continue to keep us updated. I wish I could give you both a big hug. My heart hurts for you. Give him a hug from my family. I am so shocked and sad to read this news Melly. Dear Gari introduced me to the wonderful world of Capybaras. I hope he will become more comfortable, and you can have a lot more happy times together before you have to say goodbye. Oh, dear. That is very hard. This is indeed a very difficult thing for you to deal with, especially now. The only sure thing in life is that we all will die, and we can only work towards making the time leading up to death not too horrible. You have done so much for Gari to make his life so far as pleasurable as possible. Please, if you can, keep us informed on how things go. Words are not coming. I am so very sorry, Melanie. I am so sorry to hear this. You’ve given Gari a much better life than he could’ve expected otherwise, and are now taking into account what he needs to live the rest of his life comfortably. Please skritch him for me. Oh no’s – that is very horrid news. I am so sorry Melly – you have done an amazing job caring for Gari. Scritches and hugs for all. I am sorry to hear this news. I am thankful to you for all your information on these amazing animals. My children and I would have never been introduced to the world of the Capybara if not for your tireless efforts! One of the kids did a nice school project on them and earned an A! Hugs and Kisses to Gari!! We all know you will do what’s best for Gari. He is a beloved pet to all of us thanks to your wonderful blogs. Best of everything to your whole family. A special HUGE hug to Gari. You are taking good care of him. That is what matters. He would not be around if it wasn’t for you and your compassion for Capybaras. One of our (caretakers of pets) responsibilities is to relief them from suffering when it is time. Its the most difficult decision one has to make ever. We had to do that so many times in the past and it never gets easier. I wish you all the strength you’ll need in the coming months. And don’t forget to give Gari a big hug from me! I am so sorry and sad to read this post. Like the other commenters, I would note that you have done a wonderful thing in adopting Gari and giving him a heavenly life, which has probably also been quite a bit longer than if he had been a wild capybara. Also, through this blog you have educated so many people (including me) about capybaras. I will be donating to support capybara research this year. I also wish you, Melanie, a speedy and complete recovery. I am so very sorry you and Gari are going through this. It is utterly unfair and you must feel terrible there’s nothing you can do to stop it. My heart goes out to you. I cried reading this over my breakfast. Melanie, my husband and I adore capybaras and have been faithful followers of your writings about Caplin and Gari. Your love and compassion for all living things shines through. We are atheists as well, and I commend you for making your wishes clear in that regard. Though we have never met, you have our love and support. We will be thinking of you throughout your own recovery and your remaining time with Gari. I will also make a donation to the ROUS foundation and hug my stuffed Caplin and Gari tight. I can’t find words. It’s all so sad. Gari does not deserve it, and you neither. At least, you gave him a few years of happy life… Please hug him for me. And I wish you to recover as soon and as completely as possible. I guess it’s time to post this rather than continuing to lurk about and eavesdrop. You and your capybaras have given me much pleasure. I took Capycopy to the renaissance fair last spring and never got the photos published, but it was rather amazing how many people knew about capybaras. Your ambassadorship has been a good one. Somehow, it’s not just the capybaras, but how you live your life, caring for the animals and the people around you. You teach, you have funded research, you have shared joys and sorrows. You have done it with humor and good grace, allowing others to share a special part of your life. Thank You. This is so upsetting. But the best that any of us–human, dog, capy, or whatever–can hope for at the end of our lives is that we were loved. Gari is well and truly loved by many, many people all over the world, and he has been a wonderful ambassador for his species. You have been the bright spot in his life, and I believe he knows how much he means to you. And he will be very lucky in that he will not be forced to suffer longer than necessary, because you are a kind enough person to understand that prolonging his life past the point of reason is cruel. I don’t think animals fear death like we do. I will go home and hug my Caplin and Gari capycopies tonight. You hug your real capy and give him the best life you can for as long as you can. You will treasure these months in time. Best, best wishes and healing thoughts for you and sweet Garibara. We love you. Dear Mellie, Gari, my heart aches for the both of you. You’re in my thoughts and my hopes. Melly I am so very sorry and so very sad at what you and our sweet Gari are going through. He has had a wonderful life with you. He was so very loved and I hope you can rest a little easier knowing that. I am so sorry to hear about Gari’s situation. It is a shame he had such a rough start to life. It seems that when it rains it pours. I hope you are able to get through this rough patch. It is a wonderful thing you have done for Gari, I hope his suffering is over soon. Also, I hope you recover fully from your stroke, just take one day at a time. Melly, my eyes are filled with tears and my heart is breaking for you and sweet Gari. We have all fallen in love with him as we have followed his life with you. You gave him a great gift when you took him to live with you and you have given all of us the beautiful gift of opening your heart and your home. You have allowed us to share with you the joys and tears that have come with life with Caplin and Gari. Through your voice those precious animals have become as real and present to us as the animals who share our own homes. You will never know the delight we experience each day with Gari’s posts on Facebook when things are going well for him, the disappointment we experience when we read of his difficulties, or the agony we feel when we read the sad blog of his present situation. Thank you so much for letting us share in the wonderful and painful journey of the last few years with Caplin and Gari. Without you, many of us would never have known about capybaras. You, Caplin, and Gari have been great ambassadors. Thank you, Melly, for your gracious gift. I’m so sorry. My heart aches for u & Gari. Thank u for all of the knowledge, laughter, beautiful pics & mostly for sharing ur love of animals. Best wishes. I will continue to keep my fingers crossed that one of these vet visits will bring good news. If he is taking his antibiotics, there is hope that he can fight off the infection or at the very least that whatever time he has will be spent happy and without discomfort. I am so sorry to hear all of this. Much love and healing to you, Melly and Gari. I’m so sorry to hear you and Gari are going through this. I wonder, though, that since he is being seen at a teaching hospital if the doctors wouldn’t like to put in a titanium jaw and teeth. Dental implants are not very painful, and it would be an excellent experience for the students. It’s possible now to make customized prostheses on 3-D printers. Usually it would cost a fortune, but it’s such a good learning experience for the young vets, that it would be worth their while to do it for you at a reasonable cost. And it could allow Gari to lead a normal life! I am so sorry, Melly. I know that you love Gari, and he loves you. And I know that you will do what is best for him. Thank you for taking such good care of him and loving him so much. I send both of you love and positive thoughts. I do hope that the time you have left can be filled with many, many good days. I am very thankful that Gari is with you, for he would have been/would be in so much more pain if he was alone or with someone else who is not caring and vigilant like you. Take care of each other. Having just lost two darling adorable guineapigs, I can understand a bit of what you are going through. Melly, never say you have let Gari’s admirers down. You have given him a beautiful life and the love of so many people. I believe you will know when the time comes to let him go peacefully. I am reminded of what Barbaro’s “owner” said when he was put down: “Grief is the price we pay for love.” We all are grieving yet still hoping that Gari can recover, but if he does not, know that you treated him as all animals should be treated, with respect and consideration for his needs. I hope too that you will fully recover from your stroke, but do not ever feel that you have let Gari or his friends down. Nancy (above) said it well and I have nothing to add but what she said “grief is the price we pay for love” and you’ve given us plenty! I am so very sorry to hear about the problems Garibaldi has but I am heartened to know that he has his loving family to care for him. When you brought him to our Unitarian fellowship, we all fell in love with him and have the greatest admiration for you, your husband and daughter. Thank you for all you do. Poor precious Gari. But he’s had, and is having, a loved and beautiful life. We can’t keep our pets forever, but we can give them the best life possible. Thanks for sharing Gari with the rest of us.